From a window at the Cathedral of the Immaculate Conception. One of the things I love most about Albany is the rich and storied religious architecture that peaks above more modern buildings in the downtown area. While many of the churches are open only during Sunday mass, I stopped by five historic churches before service to snap photos of some world-famous stained glass windows. Built in 1859, St. Peter's is the second-oldest protestant church in the United States and a national historic landmark. 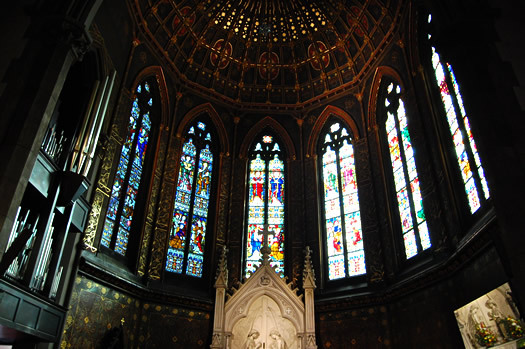 The building has a Gothic revival style, with high ceilings, mosaic-tiled floors, an impressive altar and 12 magnificent stained glass windows flanking the church aisles. 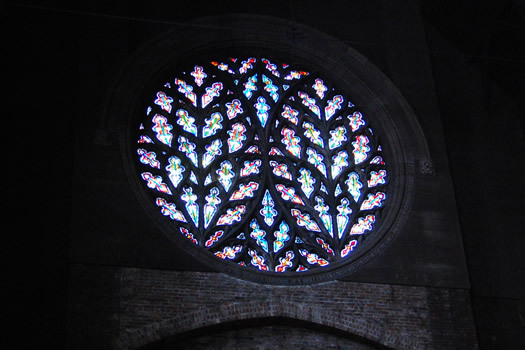 The windows date from the mid-19th century to the 20th and each was designed by an eminent English artist. 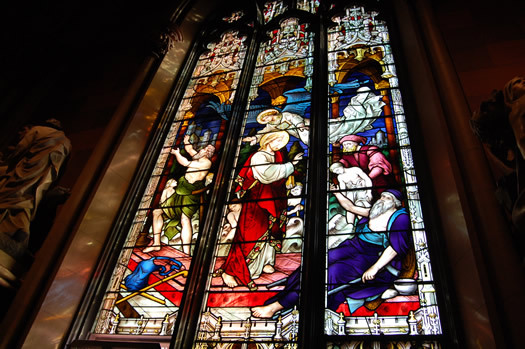 One of the windows is considered a church treasure -- it was designed by Sir Edward Burne-Jones, a British artist famous for reviving the use of stained glass in England. The 1880 window, which depicts three versions of Christ from the Old and New Testament, has vivid colors and was the first to use a new technique to make flesh tones more lively. The style was so well-received that it was later used in Westminster Abbey. In the apse, which rises above the altar, there are six tall narrow windows or "lancets." Each lancet depicts two life-sized angels playing a musical instrument, hovering over a scene in the life of St. Peter. At the rear of the church, the rose window above the organ shines deep blue and red. The beautiful window was designed and made by the Tiffany Company in 1890. Four of the inside panes were specially treated to shine less brightly, so as to resemble a cross when the light streams in. After about 15 months of being closed for renovation, the Cathedral of the Immaculate Conception reopened its doors about three weeks ago. The church, which is also on the National Register of Historic Places, was the tallest point in Albany went it opened 157 years ago. 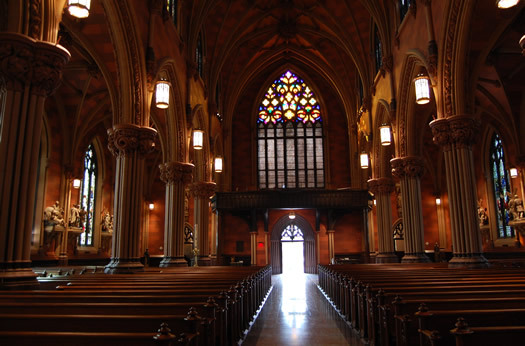 Now it serves as the mother church in the 14-county Albany Roman Catholic diocese and is famous for its haunting Gothic design and gorgeous interior decoration. Inside, two stained glass windows remain from the time of the church's dedication. One, known as the "Lady window," depicts the main events from the Virgin's life. 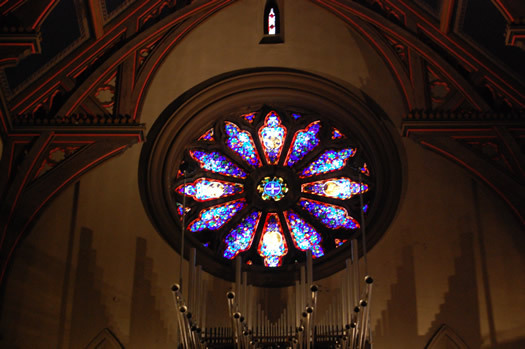 The other is the resplendent rose window above the organ loft, which stands out with its deep blue, gold, green and fuchsia jewel tones. Most of the other windows, which line the aisles, were placed in the church in 1902 and were specially designed by the English Hardman & Co., one of the world's leading manufacturers of stained glass. 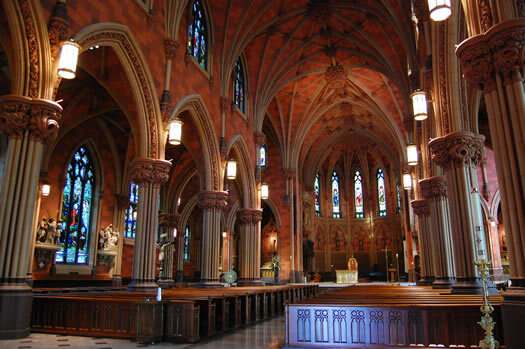 Albany's other cathedral, All Saints was the first Episcopal cathedral built in the United States and ranks fifth in size in the nation. Construction of the immense, yet less ornamental, church began in 1884 and has not been completed. 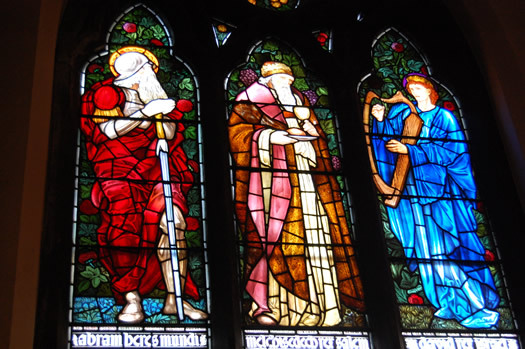 The church is home to one of the world's most impressive collections of stained glass by Clayton and Bell, one of England's most prolific stained glass producers in the latter 19th century. Much of Clayton and Bell's work was destroyed during the World War II bombings in London. Behind a wrought iron crown of thorns and above a golden mosaic-trimmed altar is the Great East Window, one of the largest stained glass windows in the world. It was recently dismantled and reinstalled in 2003 after the glass became weak and needed repair. 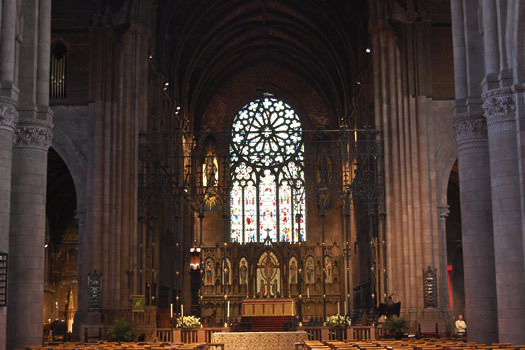 To the north and south of the altar are two large rose windows, both designed by the same Clayton and Bell artist. They measure about 20 feet in diameter and reflect what looks like jewel-toned paisley light. 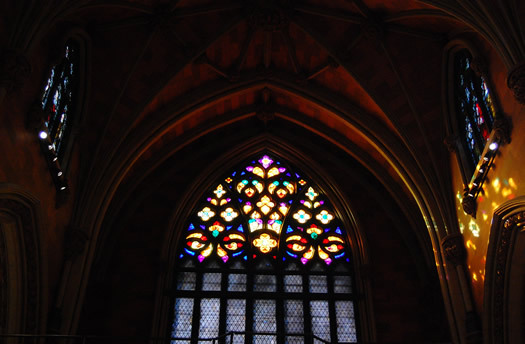 One is a replica of the "Bishop's Eye" (above), a well-known window in England's Lincoln Cathedral. 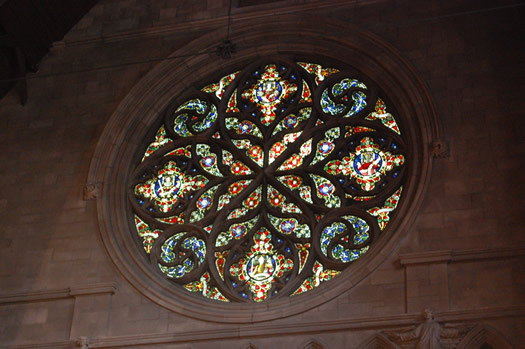 Also of note, the rose window above the South Swan entrance was the only one designed by an American -- New York's famed stained glass maker John LaFarge. Historic St. Mary's -- the second-oldest parish in the state -- has had three homes in Albany, the last of which was built in 1870. But its the unique blending of architectural styles that makes this church a one-of-a-kind. The building's exterior is distinctly Italian Romanesque with its simple, geometrical forms and lack of ornamentation. 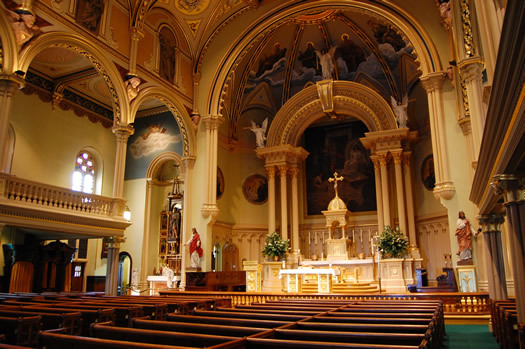 But the interior is pure Italian Baroque with a rich use of sculptures and frescoes depicting icons and saints. Three white, almost life-sized angels blow trumpets over the altar and gold embellishments line the high ceiling. 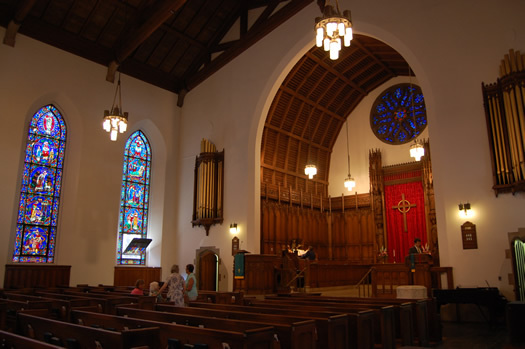 But the eight large-paneled stained glass windows along the pews would never have appeared in an Italian church during the 17th or 18th century, making this stylistic addition one that draws from the 19th century Gothic revival. 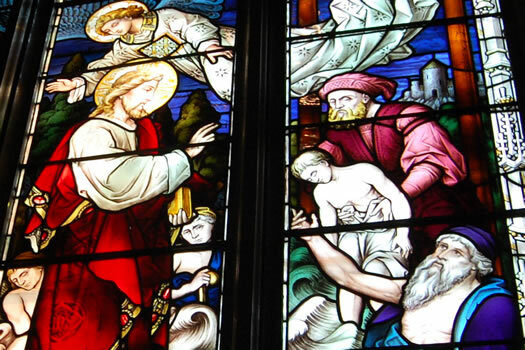 The glass colors are vivid and deep and depict classic Biblical scenes such as the crucifixion, the miracle of water turning into wine and the descent of the Holy Spirit upon the Apostles. Built in 1861, Westminster is a dark red church with distinctly Gothic inspiration, complete with a labyrinth below the church's sanctuary. Though the stained glass windows are relatively new, compared to the other historic churches in the area, they are no less magnificent. 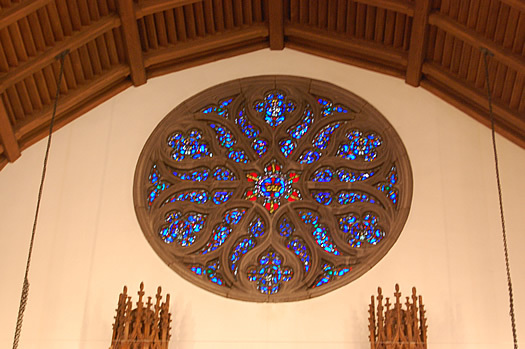 Above the altar is a deep blue- and ruby-colored rose window, the colors representing heaven and love, respectively. The ornamental lines envelop a veritable menagerie: six angels, a fish, a tulip and a butterfly are present to represent God's kingdom. There are 10 tall stained glass windows that line the church aisles, designed between the 1930s until as recent as 2000, when the final window was added. 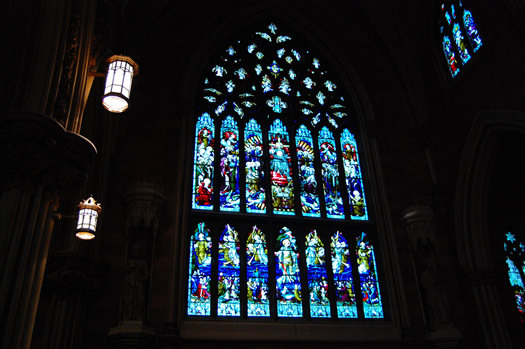 The older windows were created by Wilbur H. Burham, a renowned Boston stained glass craftsman. You can easily identify the newer windows, as they use much lighter colors -- a trend in stained glass window production. Beautiful pictures and snippets of history. I think I should take a tour of my own! 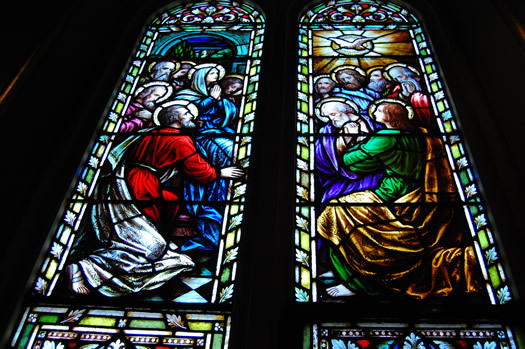 Last year at the FLUX art show, I took some photographs of the stained glass windows at St. Joseph's Church. First Pres on the corner of State and Willett is also worth a visit. The windows are spectacular and some were done by Tiffany - the State Street side I believe. Awesome! Beautiful! I love poking around in churches, but I'm always afraid I'll irritate people. Is it alright to just walk in and look around? @Summer: It is definitely OK to just walk in and look around -- every church I visited was very welcoming, so long as I was out before the service started. If the pastor was around I asked permission to take photos, but no one turned me down. I tried to get there about 40 to 30 minutes before the service started or right after it ended so there would be people there to show me around. Most of the churches also had free pamphlets with building history and a map. All of these churches had Sunday masses between 7:30 and 10:30 a.m.; some also have weekday masses -- they all list their schedules on their websites. I also go to churches to photograph their windows. I usually go during business hours - not on Sunday. If the building is locked, I will go to the office. Someone will (usually) go and unlock the church. I lock it back when I leave, then 'check out' at the office. I wrote a blog (Nov 2009) on my 'Vacation Photos'. You would enjoy seeing it. Go to my web site, click on, our blog', then scroll back to Vacation Photos. I know its not Albany, but the Oakwood Cemetery in Troy has the Gardner Earl Memorial Chapel and Crematorium which has 8 Tiffany stained-glass windows(from early in Louis Comfort Tiffanyâ€™s career). This stained glass is some of the beautiful I have ever seen. The Sumner window at the First church in Albany (110 North Pearl Street, near the palace theater).is a spectacular Tiffany pictorial window which is so highly regarded that it was displayed in New York and Washington as part of a Tiffany retrospective. It should be a must on every downtown tour. The sanctuary also has all Tiffany windows made of the opaque glass we all know. And yes I can attest the the windows at first Presbyterian are indeed Tiffany. I am currently working on a large number of stained glass windows that were recently removed from the Old Albany High Shool on Western Avenue inorder to preserve them from further deterioration. 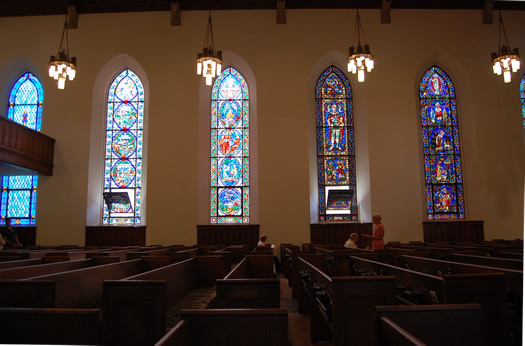 The windows were originally made for the Albany High School on Chapel and Eagle streets and were installed what was then called the Chapel. They are now in boxes in storage in a ACSD building. I have been communicating with Superintendent Colluciello concerning a fund to restore and reinstall the windows in a school building yet to be determined. I would appreciate it I could speak with you about the best way to raise monry for the restoration. They were removed by Chapman stained glass and may have been made by them. I'm aware that this post is 4 years old, but I do feel that a correction needs to be pointed out. In the Cathedral of All Saints (Episcopal) The Rose Window in the North Transept was by Maitland Armstrong of New York and the Rose Window in the South Transept was by Clayton and Bell. Also please note that the six large windows in the nave (and also some in the transepts) were done by Burlisson and Gryll of London (designers formerly associated with Clayton and Bell). Source: Albany Cathedral Guide Book, Fifth Edition 1938.